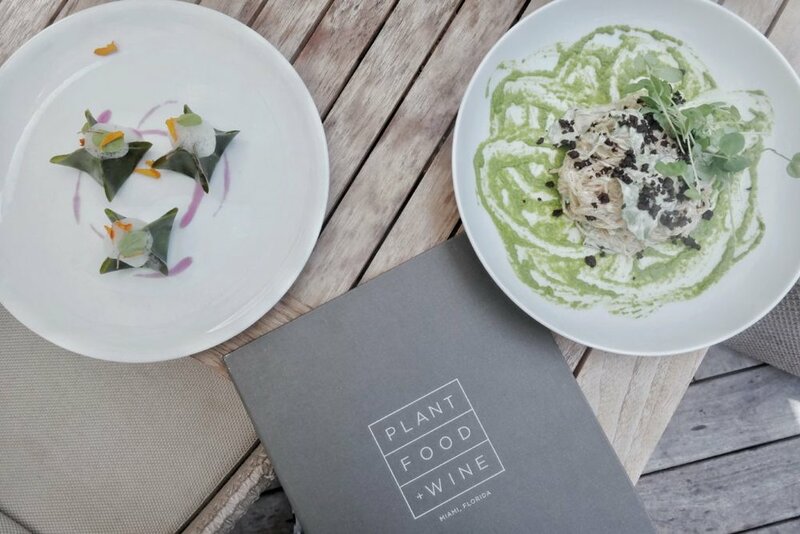 Plant Food + Wine is a blissful restaurant-bar escape in downtown Miami, and a vegetarian restaurant like no other. The PlantLab group has a few restaurants around the world in cities that also include LA, New York and London. Their reputation and level of hospitality lives up to every expectation. This Miami spot sources their incredible food from local farmers markets to bring clients the freshest alternative cuisine. The quality of fruits, vegetables, sprouts, and wines is evident in every dish on their plant-based menu. Everything the waitress recommended was nothing short of how wonderful she said it would all be. The Kimchi Dumplings, made with cilantro coconut wrapper and ginger foam to start, followed by the Cacio E Pepe made with kelp noodles, peppery greens, green olive puree, and sun-dried olives. They do not use any starches here so all the noodles are kelp. Daikon is also seen throughout the menu in various ways. One of my faves! The staff was friendly and kind. Both settings inside and outside were luxurious and comfortable. I had the pleasure of staying and enjoying the breeze on the terrace as I worked and dinned. It is one of my favourite things to do while traveling… to find a location that is welcoming where you can take your time to eat, work, drink and relax. This is how I work-travel and I would certainly return to Plant Food + Wine. In fact, I plan on visiting some of their other locations, especially those in L.A., so stay tuned for more from this group.